fhana - Wonder Stella · forums · community | osu! Last edited by toybot October 22, 2016 at 11:00:51 PM GMT , edited 28 times in total. 22:35 Mikii: don't you think the overall spacing in the verses is a bit low for 5.79? 22:37 Mikii: ok my points is!! 22:40 Mikii: just feels better overall imo! 23:24 Mikii: 02:02:913 (1) - stuff like ctrl+g makes the flow nicer? 23:26 Mikii: 02:23:198 (2) - add circle? 23:31 Mikii: 04:23:898 (2,3) - Ctrl+g switches distance any better? 23:32 Mikii: 04:44:727 (1) - curve with anchor going down? 00:36:333 (3,5) - Fix stack? 01:50:634 (1) - Very powerful sound, deserves some more spacing than this imo. That's all I can find. Great map, and apologies for the bad mod. 01:43:017 (4,1) - - Could you move 1 to X:336 Y:277 and 4 to x:396 y:338 ? Just to remove that overlap. // thanks for the mods! RED = CHANGED IT GOD DAMMIT !! Ok so it was a really quick map because this beatmap is more or less very good, jumps are well placed and the rythmic is well followed too so have fun mapping ! 00:52:965 (3,4,5,1) - mhmhmhmh can be better // how ? 00:40:530 (3) - make this one straight to fit with all the others? 02:30:426 (1) - ctrl g for better emphasis? 03:22:810 (2,3,4) - 03:23:277 (2,3,4) - any reason why these are bigger in spacing than 03:23:742 (2,3,4) - 03:24:208 (2,3,4) - ? This would honestly make a great cs5 map if you nerfed a bit of the jump patterns, this map is much more flow and pattern orieinted than jump oriented so it'd be nice if you considered it // i think i can actually go with this..
04:16:437 (1,1) - i don't think SV usage is very good here, i think you need to make 04:16:437 (1) - have 0.8 and 04:17:369 (1) - have 0.7 instead of the other way around, creates much more emphasis and a buildup-like feel // idk i guess it's just me but i just like using slower sliders for held tension spots like here. 02:50:634 (2) - Stack with 02:49:545 (3) - 's head maybe? 04:36:955 (5,1) - Blanket maybe? 00:51:255 (2,3,4,5,6) - i get the reasoning behind vocals on 23 and then switching to percussion on 456, but using spacing as the only contrast isn't really effective in my opinion. leaving 23 as a slider would work as a compromise here. 00:57:473 (1,1,1) - minor sv changes + NC don't really look too good if its not obvious (its not obvious here when its not 'easily comparable' between the sliders). i suggest something like this http://i.imgur.com/xfxklMQ.png, considering 1 is jsuit a 'breath'. 01:12:084 (1) - the loud sound is on 01:11:929 (3) - , so this kinda takes away the impact from it. - for what is letterboxing enabled? - 00:18:613 (1) - well u used here clap on end where 00:19:079 (2) - use drum sample. also i would add a clap on 00:18:613 (1) - cuz there is really strong kick. - 01:02:602 (2) - how about moving this around 40/164 so the follow arrows will perfectly puncture the 01:01:981 (1) - slidecurve? looks really neat tho. - 01:19:545 (1) - 01:20:634 (4) - 01:20:789 (1) - try to add a clap on ends/circle, they deserved it. - 01:29:494 (3,4) - 01:39:441 (3,4) - kinda confusing cause of snap changing.. maybe give a try and NC the (4) ones? 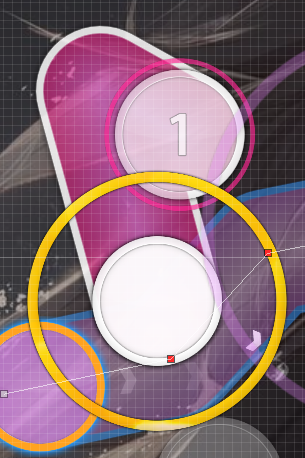 - 02:10:452 (3) - hmm, probably just me but that circle is hard to read while gameplay. i would just unstack it a bit like 216/256 ? - 02:35:245 (4) - 02:39:908 (3) - missing claps. - 02:41:307 (1,2,3,4,5) - dat stream is unexpected lol. also 02:41:540 (4) - is barely audiable, really i don't hear anything here zzz. if you want, split 02:41:462 (3,4) - into 1/4 slider so it will be more intuitive to play. - 02:53:431 (1) - is this nc nessesary? that one nothing changes in playability lol. - 03:38:665 (3,1) - add drum sample on circle / slider end. - 04:02:136 (2) - listen it in 25% i hear more the vocal beat on 04:02:175 - tho. i didn't hear that song before!!!!!!!!! - 02:41:307 (1,2,3,4,5) - dat stream is unexpected lol. also 02:41:540 (4) - is barely audiable, really i don't hear anything here zzz. if you want, split 02:41:462 (3,4) - into 1/4 slider so it will be more intuitive to play. // no i think it's quite playable already..
00:29:338 - Pretty strong drum, consider making it clickable? 01:08:354 (1,1) - intentionally not stacked? This easily makes top two of my favorite wonder stella map :^) Looks really good. GL // thanks! 00:11:773 (3,1,2,3) - uh well the triple is at 00:11:929 and not at where you mapped it. You do this a lot actually, I think it's weird you skip drum beats but then also use additive rhythming. There's not really anything wrong with it, but when done so close together it's really noticeable, and it feels like you're not really mapping the song anymore. 00:14:882 (1,2,3,4,5,6,1,2,3) - You should save your big jump patterns for when they really matter, this feels like you just ran out of ideas and put filler jumps in. 00:56:385 (1) - I think you should change the slidershape to have more impact into the next circle, right now the player stops following the sliderbody halfway through, whereas 00:55:763 (1) - is fully played through and has more power to it. 00:59:649 (1) - If you change this slidershape to something more simple, the 01:00:271 (3) - tail will have more power. Right now since this slidertail doesn't map to a beat, I don't expect 3's tail to map to a beat either, so it feels really weak. 01:15:815 (1,2,1,2) - compared to 01:13:328 (1,2) - these really feel like boring filler jumps..
03:04:312 (2,1) - Compare this huge jump for a weak vocal to the 03:02:758 (1,2,3,4) - pattern. Your emphasis in general is really weird to me. 03:25:141 (1,2) - I don't really get why this is so small compared to 03:24:520 (1,2,3,4,5) - when the former is clearly more intense. 04:16:437 (1,1) - Definitely think you should change this part. This is just two sliderart back to back, so you're mapping two totally different feeling sounds into what plays like the same pattern.